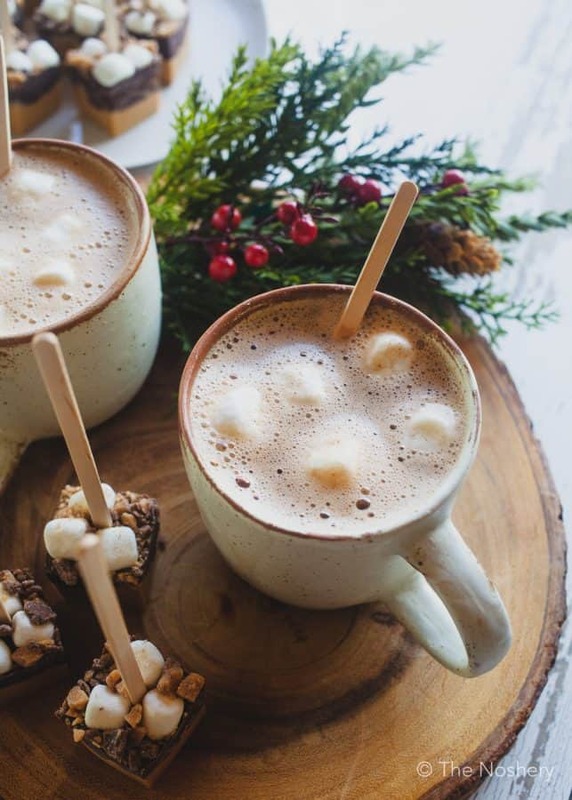 Hot Chocolate Sticks | It’s Christmas time and it’s getting really cold outside. There are so many treats that I love this time of the year. 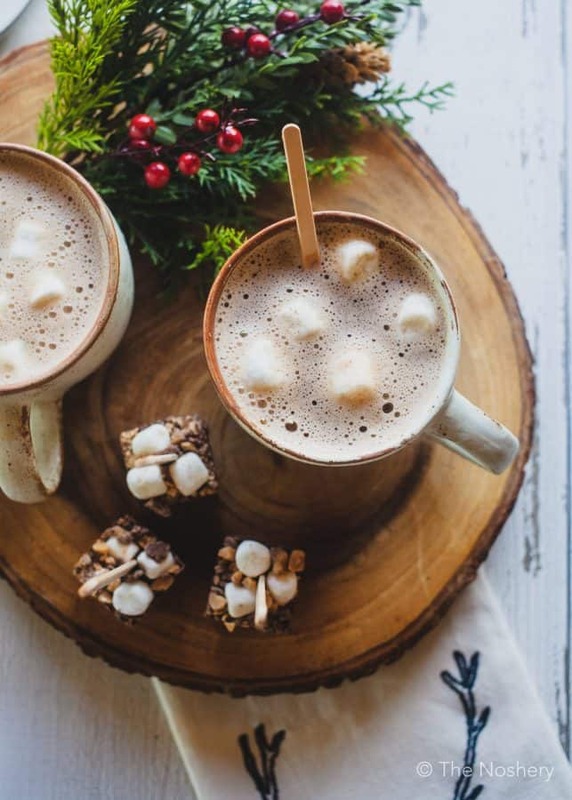 Of course, I love some Puerto Rican classics like coquito and tembleque but if I am craving something sweet, hot, and creamy I want a cup of hot chocolate. Growing up my mom would make hot chocolate with shaved semi-sweet chocolate. I never had hot chocolate made from a packet until a friends’ mother made it for me. Eventually, my mother started using hot chocolate packets, but melted chocolate hot chocolate is a treat. In the spirit of melted hot chocolate, I decided to make some fun hot chocolate sticks. But, not just any hot chocolate sticks I made peanut butter hot chocolate sticks. I mean who doesn’t love the combination of peanut butter and chocolate. It’s classic, comforting, and freaking addictive. Toss these little squares on sticks in a bag and you have a great edible treat to give you to friends, families, and co-workers. First, you need a mold. 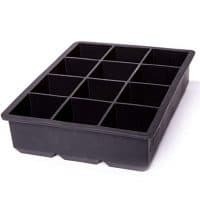 I find a silicone mold works best because it makes it easier to remove the chocolate cubes. But any candy mold can be used. If you don’t have candy or silicon molds you can also use mini cupcake molds lined with cupcake liners. Regardless of the shape of the mold, you choose I used molds that hold 2 tables spoons in each cube. So, take that into account. 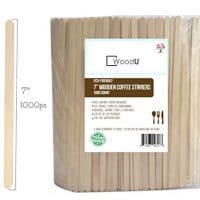 If you like you can use plastic spoons, wood spoons, popsicle sticks, or nothing in place of the wood stir sticks. Heat the milk to almost scalding to be sure the milk is hot enough to melt the chocolate cube. If you like marshmallows floating in your hot chocolate have some extra mini marshmallows handy because the marshmallows garnishing the cubes will melt. The combination of peanut butter and chocolate is like drinking a hot creamy peanut butter cup. And who doesn’t want that for Christmas? Heck who doesn’t want that year round? I really enjoyed curling up with a mug of this hot peanut butter cup and when I passed them out as gifts everyone was very excited. However, I confess I kept a few to nibble on right off the stick. If you’re not drinking dairy you can stir these into any hot milk alternative. I think it would be wonderful with almond milk, cashew milk, coconut milk, or rice milk. You can also stir it into a hot cup of coffee. Now, that would be awesome. What I love about these is how incredibly easy they are to make. And your friends and family will get such a kick out fo them. You can never go wrong with a melted peanut butter cup in a mug. 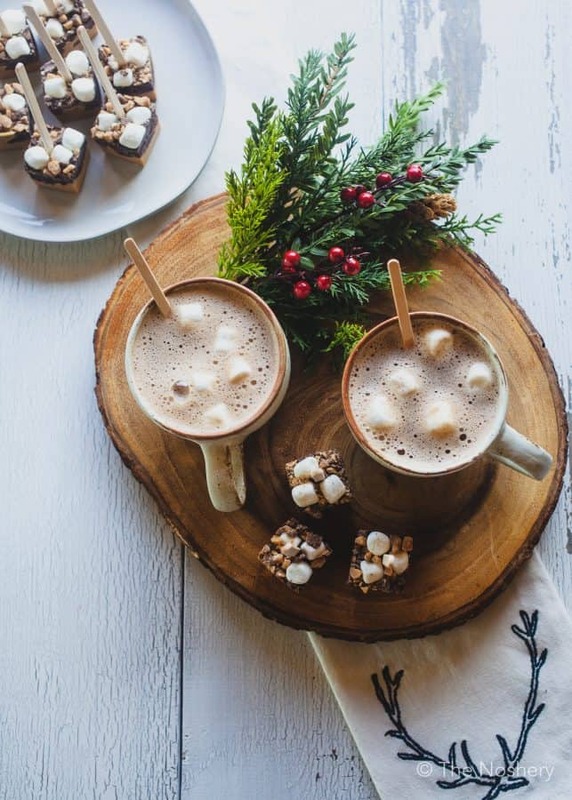 What are some of your favorite edible gifts to share give for Christmas? If you are looking for more edible gifts or desserts to exchange visit my collection of sweet treats. 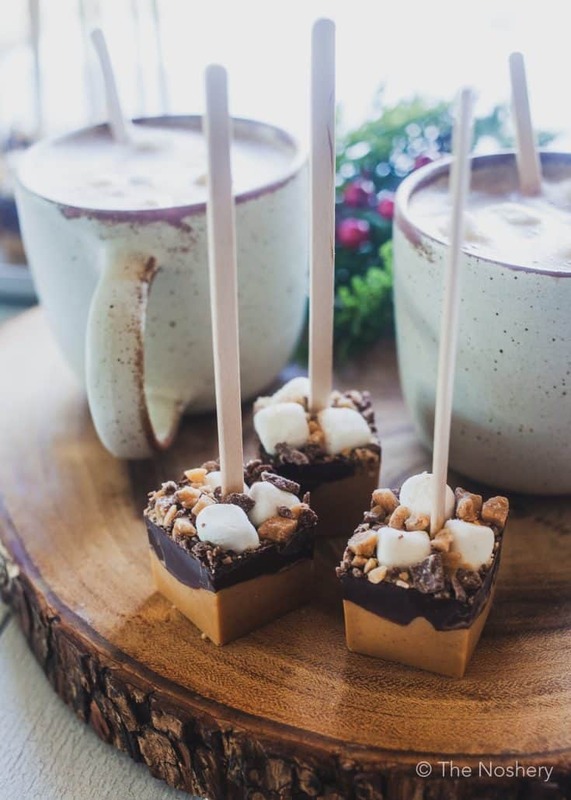 Peanut Butter Hot Chocolate Sticks | These hot chocolate sticks don't only make a great holiday gift but also have little peanut butter and a chocolate twist. Place the chocolate and peanut butter chips into separate microwave safe bowls. Heating one bowl at a time melt the chips on high for approximately 2 minutes, stopping at 30 second increments to stir. Remove from microwave when you notice the chocolate is almost completely melted. Stir until smooth. Spoon each mold half way with melted peanut butter. Then spoon with chocolate up to the top. Add mini marshmallows and toffee chips to the top and gently press down to make sure the toppings are in the chocolate. Place sticks in the middle of each mold. Heat 2 cups of whole milk (or milk of choice) in a small sauce pan over medium heat for a few minutes. Heat it to almost scalding. 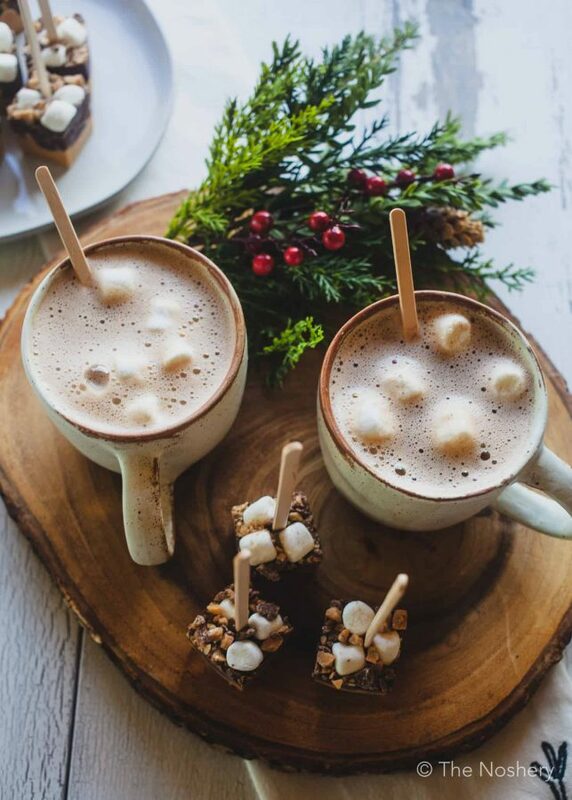 Pour into a large mug and add hot chocolate stick. Let sit for 30 seconds and stir. Add more marshmallows if desired. Enjoy.